Engraving of Cornelius Mathews, from the Cyclopaedia of American literature by Evert Augustus Duyckinck, George Long Duyckinck, Buckingham Smith, and John Dawson Gilmany Shea. Published by C. Scribner, 1856. 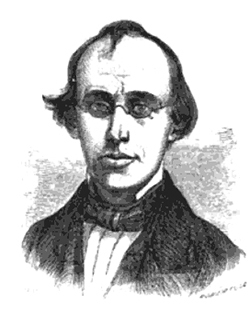 American author Cornelius Mathews was a member of the literary group Young America, and was even a contemporary of Edgar Allen Poe for a time. He was disapproving of the idea American writers should adopt the English style of writing, and named his movement toward a new style of writing the Young America movement in 1845. His collection of Indian fairy tales, The Indian Fairy Book, was published in 1869. The stories for children feature Native American legends represents the only collection of folklore by Mathews, and were complied thanks to Henry R. Schoolcraft. The book was later published under the revised title The Enchanted Moccasins. Its tales represent some of the best lore of the Indian people, who had retold these stories to their children for generations. He was also a contributor and editor to a number of New York magazines, including the New-Yorker, The New York Review, the Yankee Doodle and more.